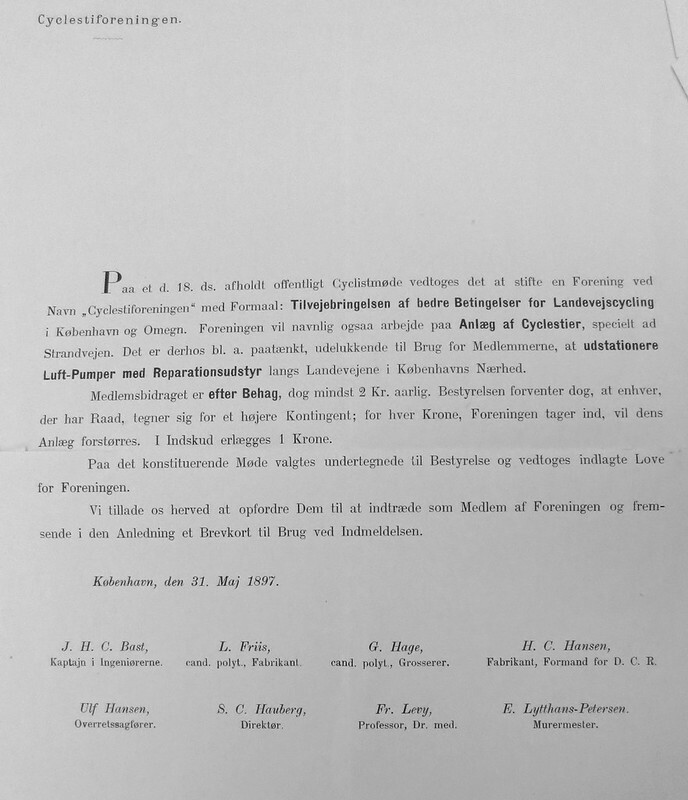 I found this letter regarding the founding of a new cyclist organisation in the City of Copenhagen's archives. I love the name of the association. The association, it says on the letter, was founded on 18 May, 1897. "At a public cyclist meeting on the 18th of this month it was agreed to form an association with the name The Cycle Track Association (Cykelstiforeningen). The goal of the association being lobbying for better conditions for road cycling in Copenhagen and surrounding area. The association will also work towards establishing cycle tracks, especially along Strandvejen (the coast road north of Copenhagen). It is also under consideration to establish, for use only by members, air pumps and repair equipment along the roads in the vicinity of Copenhagen." The fee was anything you like, as long as it was at least 2 kroner. So don't go thinking this quest for safe infrastructure for Citizen Cyclists in our cities is some new-fangled thing. The first separated infrastructure for cyclists in the world was created in 1892 in Copenhagen. We've written previously about the countless bicycle clubs and associations formed in the heady days of Bicycle Culture 1.0 and you can see many of them here - Bicycle Club Names in the 1890s.